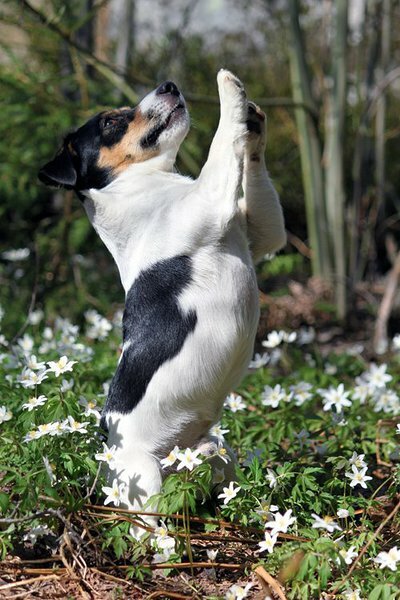 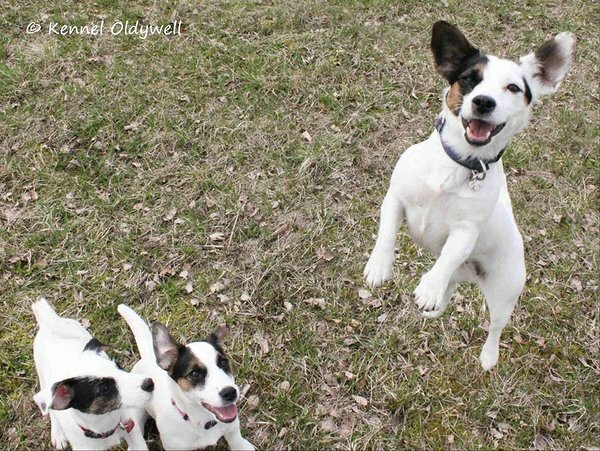 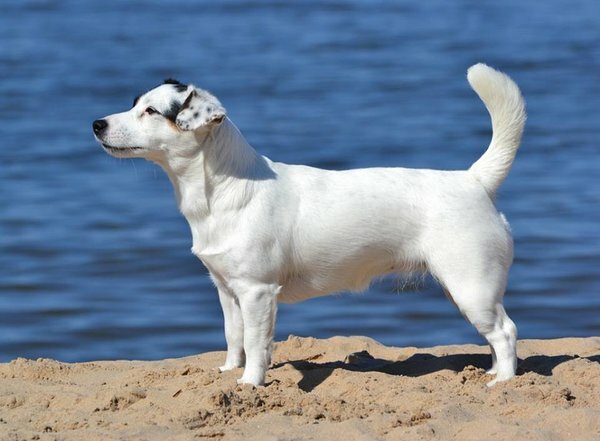 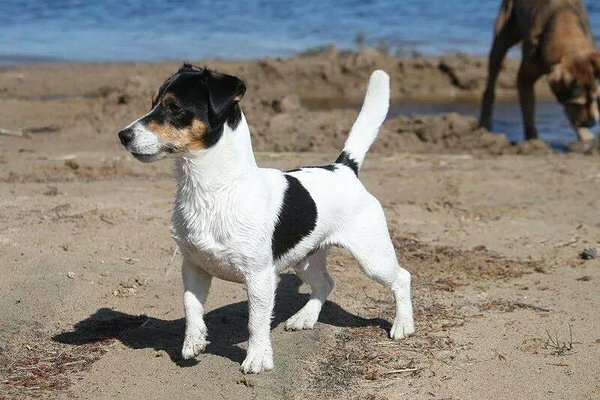 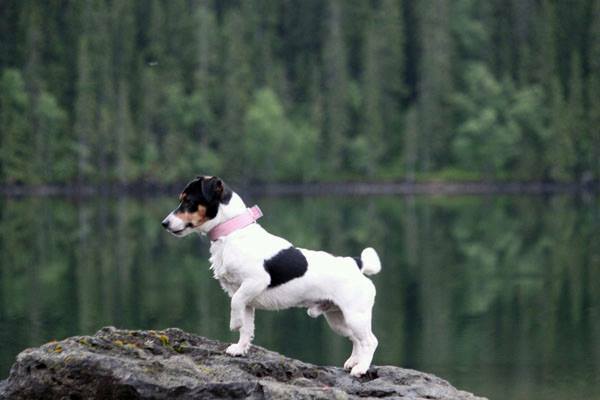 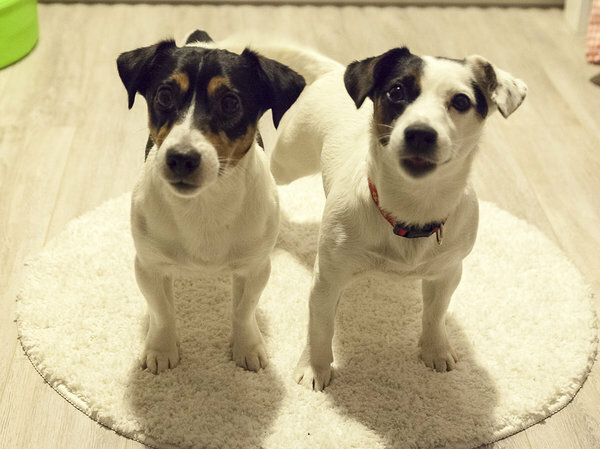 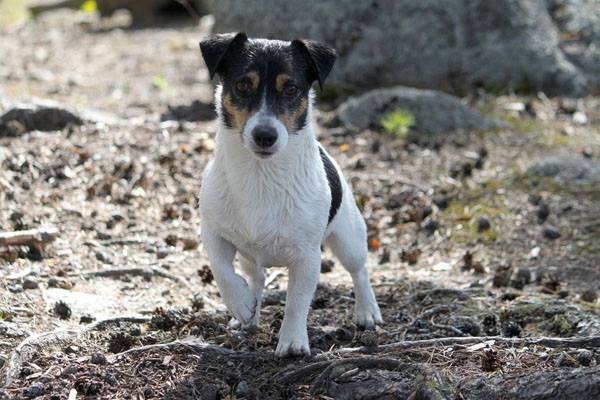 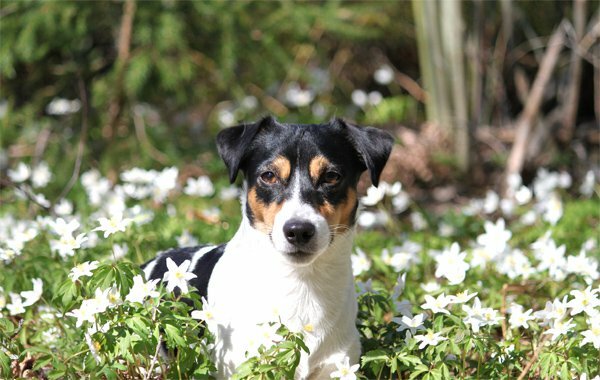 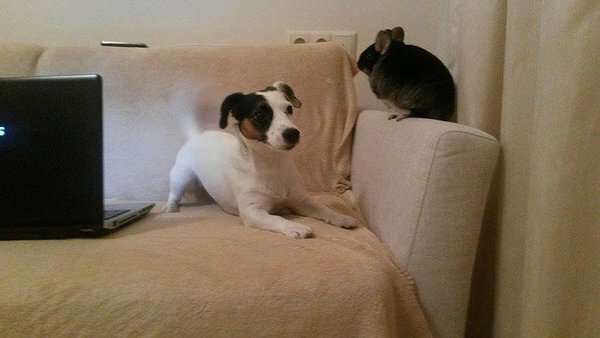 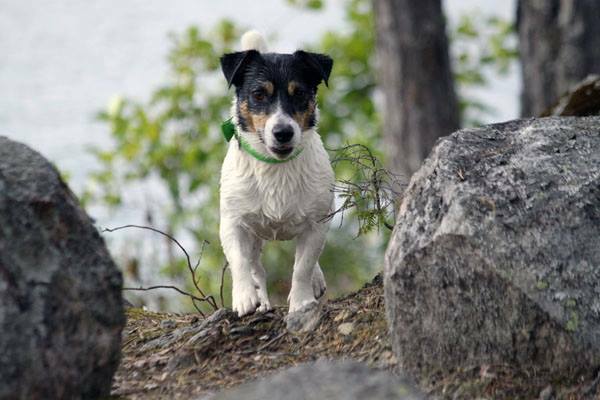 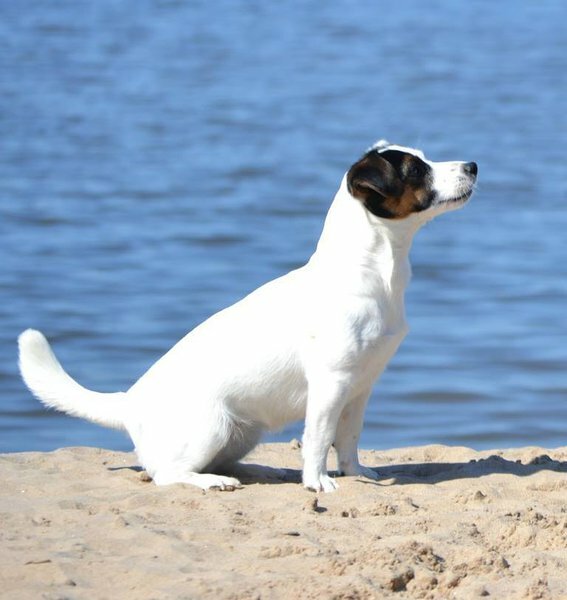 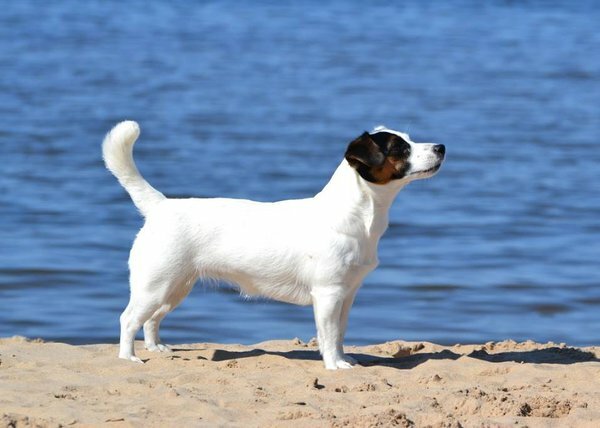 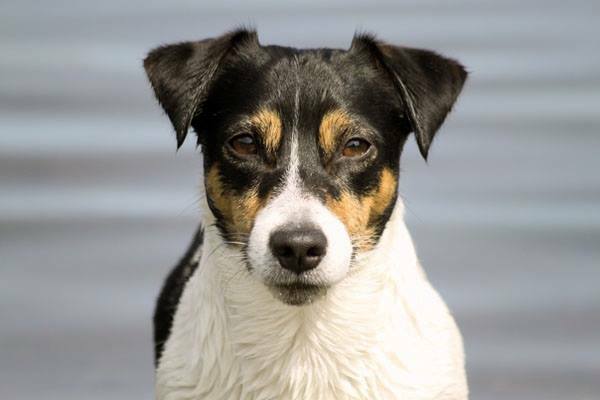 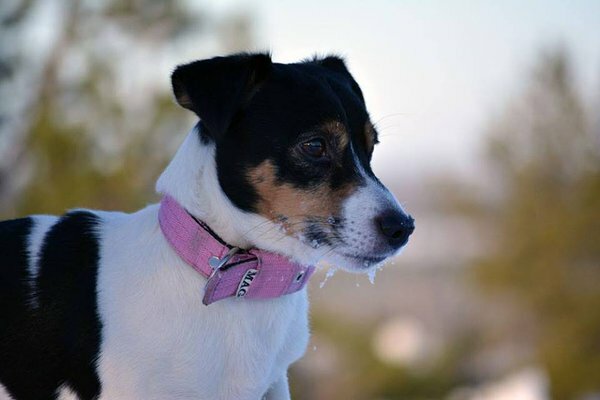 Very friendly, smart, fast male jack russell terrier from Sweden. 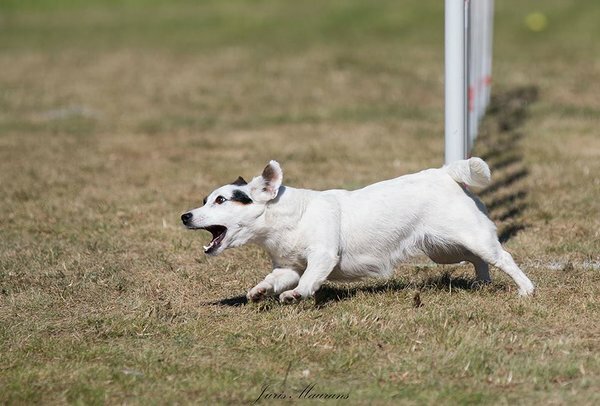 Yatzy is from kennel Raaw. 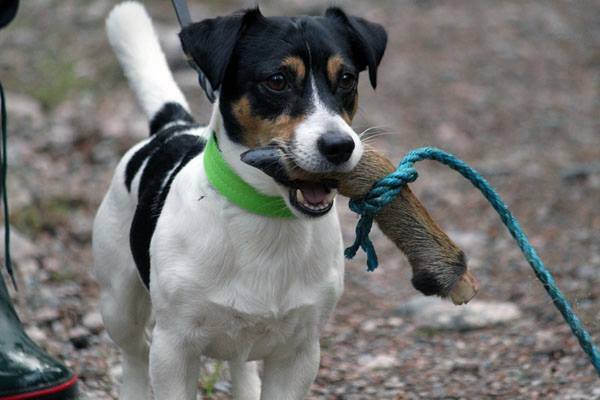 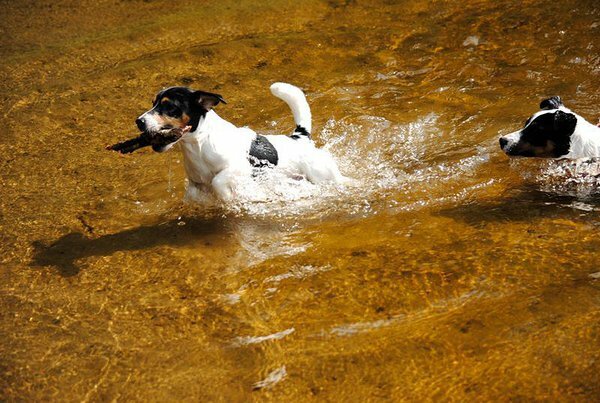 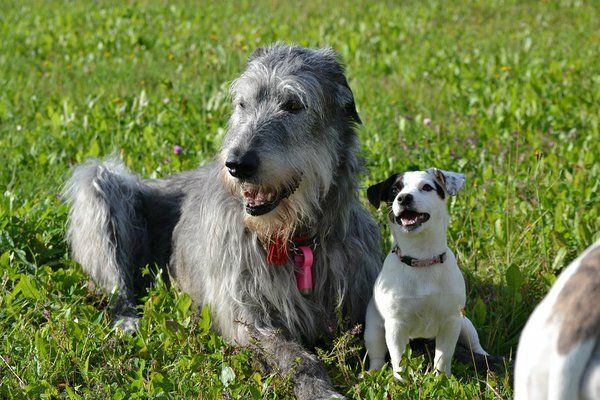 His father is a very good learner Brösing´s Jack Take It Or Leave It "Bob" and maother is an approved hunting dog Nu Ch Stella. 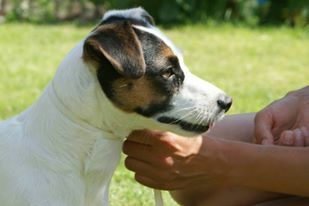 More info about Yatzy's parents and pedigree please look at here. 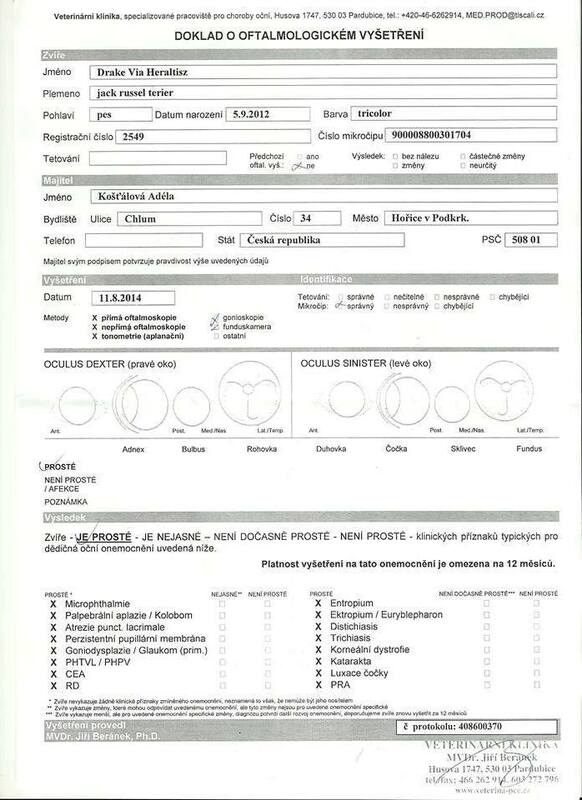 Eyes examination: 2.03.2015 - crear of PLL, PRA, RD, HC. 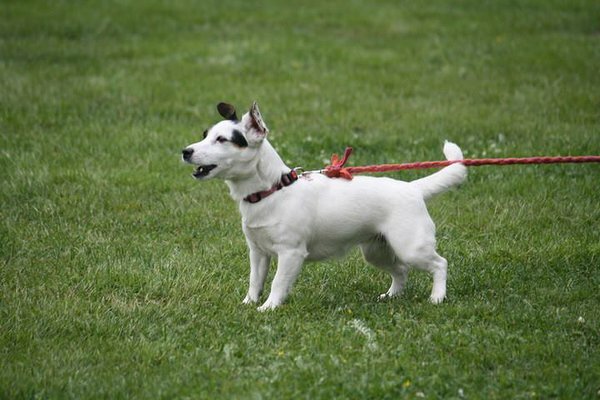 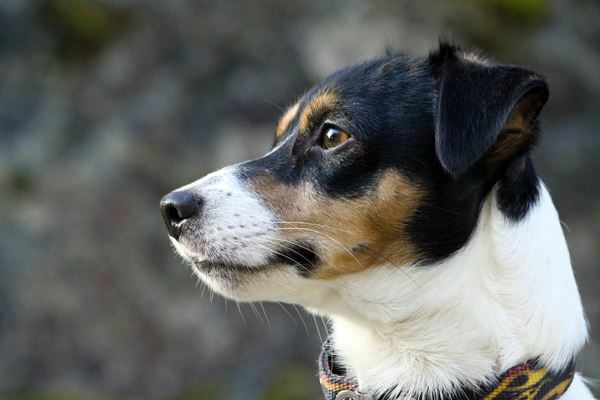 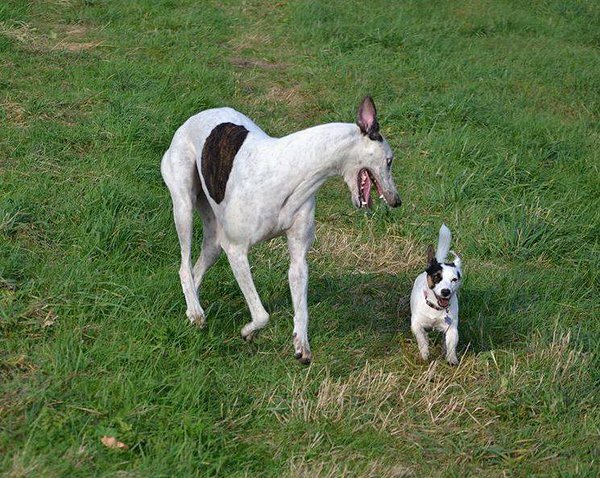 Y Yatzy is obedient small male with great jumping ability. 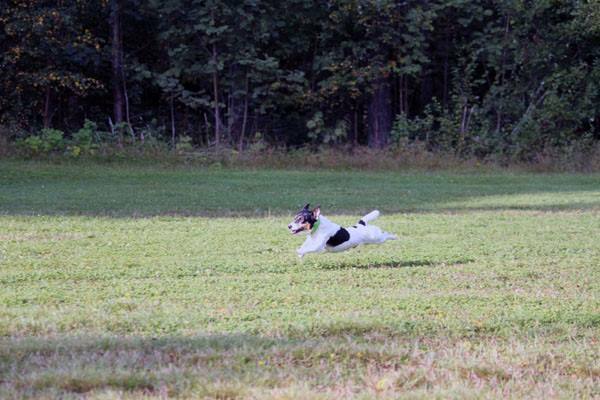 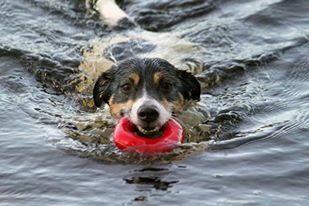 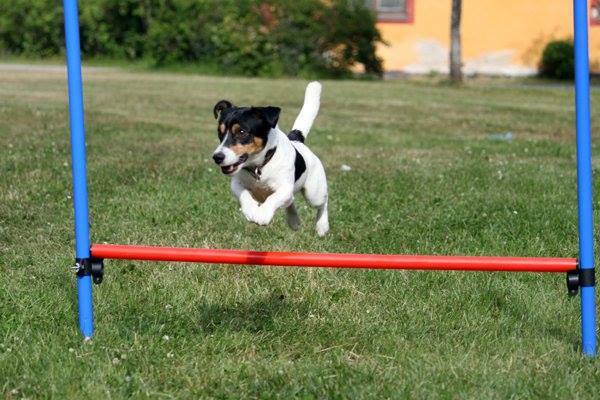 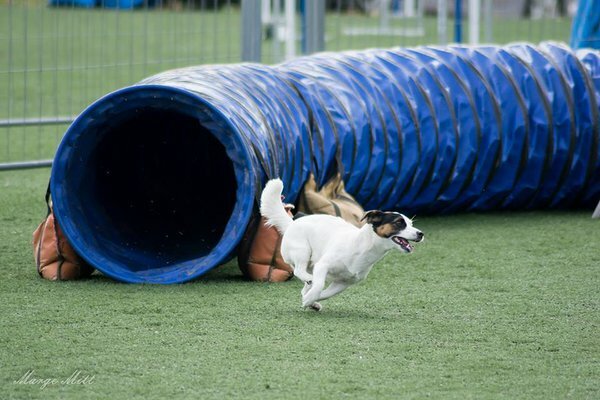 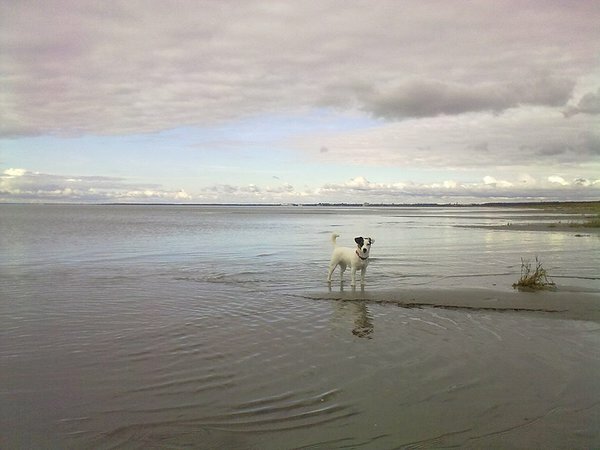 Yatzy is doing as a hobby obedience, agility and some hunting dog exercises. 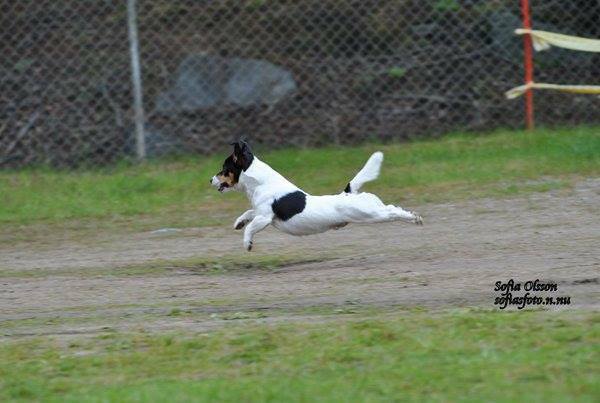 Yatsy is a master of tricks. 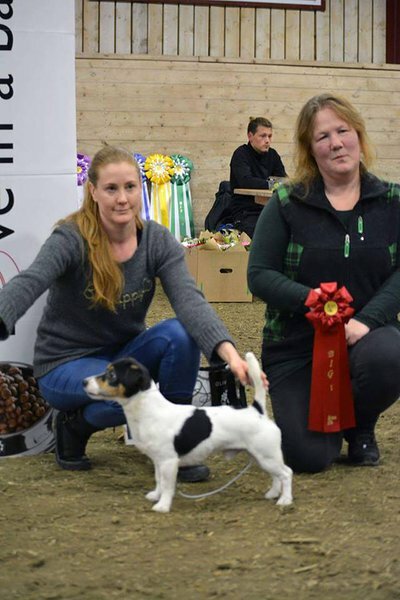 Yatzy is successful showdog. 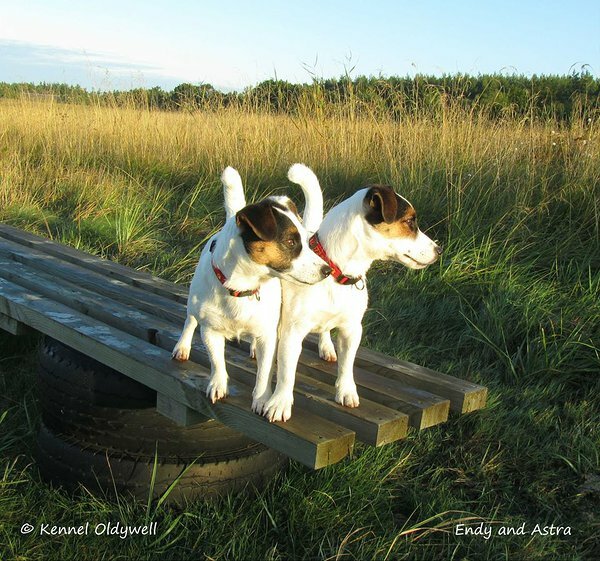 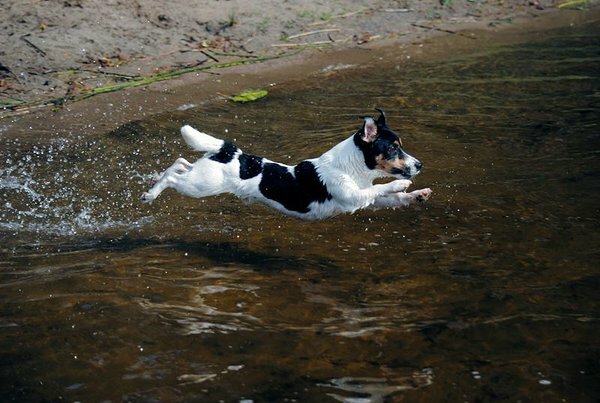 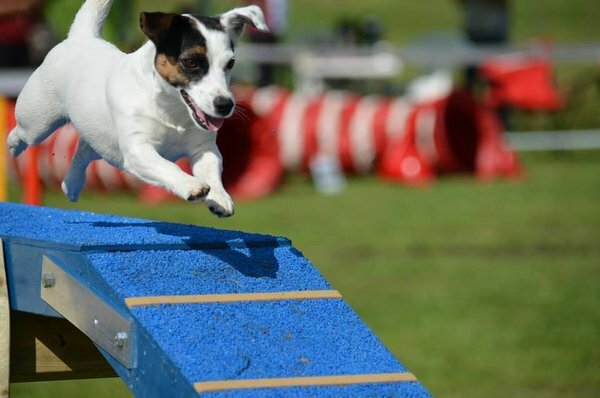 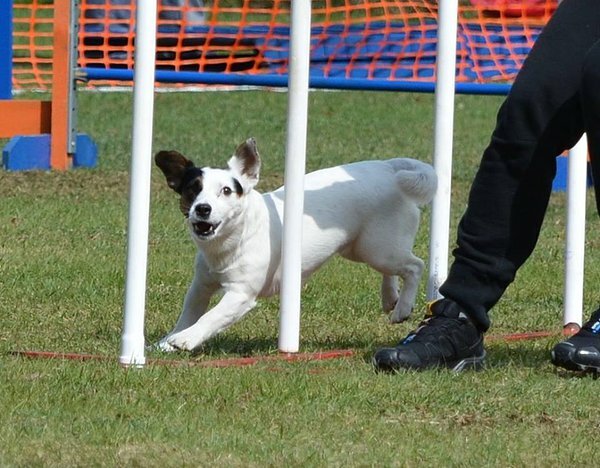 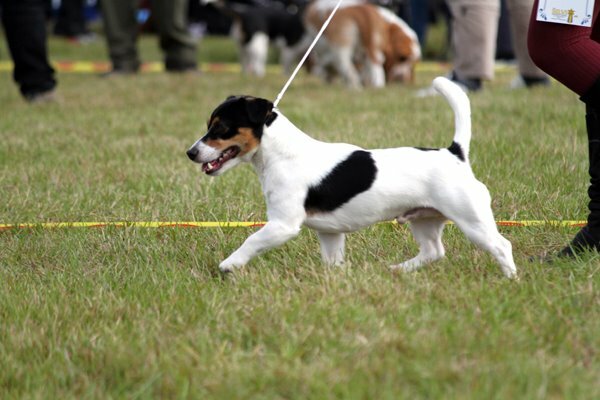 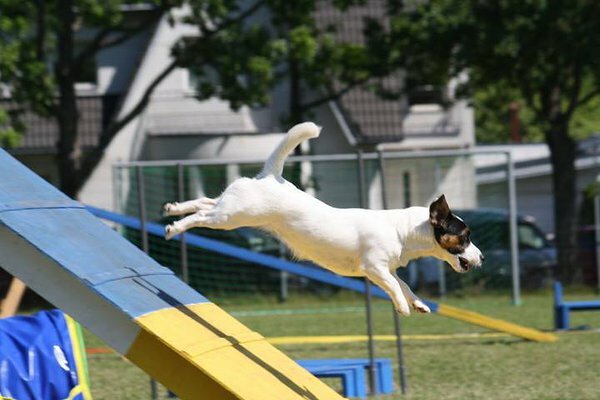 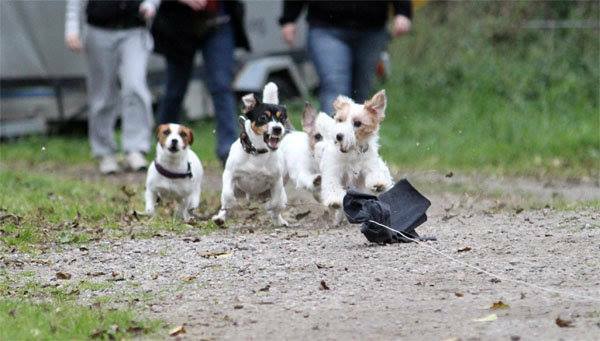 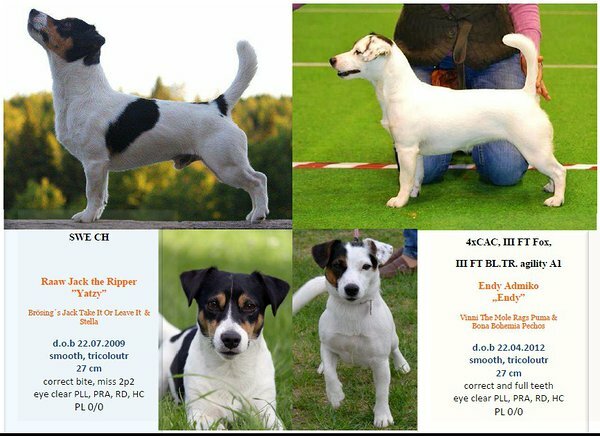 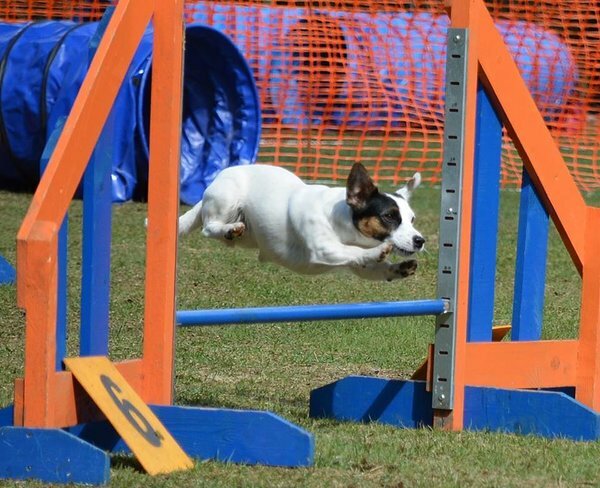 Some achievements here: in puppy class BOB, BOG1 and BIS4 puppy; in junior class BIS junior in Speciality Show for Jack Russell Terriers 2010; in open class Sweden Ch from 2011, BOB, BIG1, BIS3. 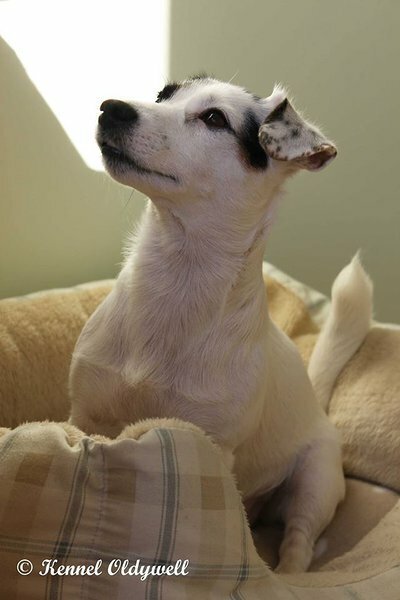 Endy is a charming and fabulous little girl. 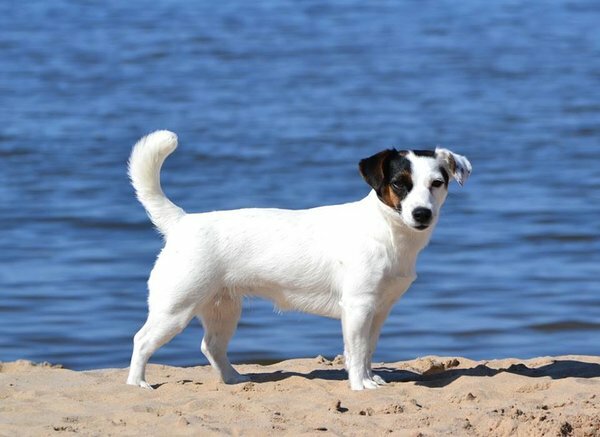 She is very sociable, always cheerful and obedient. 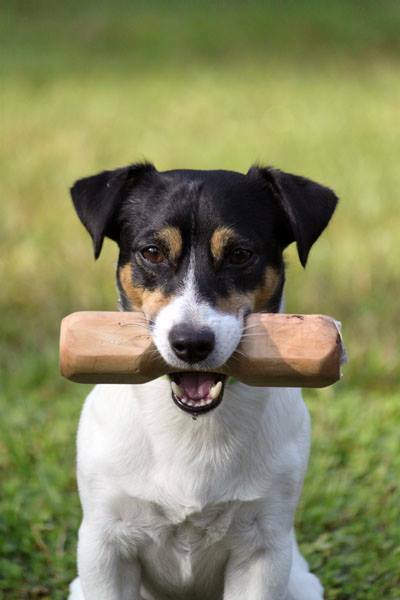 Endy likes to work and she is very motivated to learn new things. 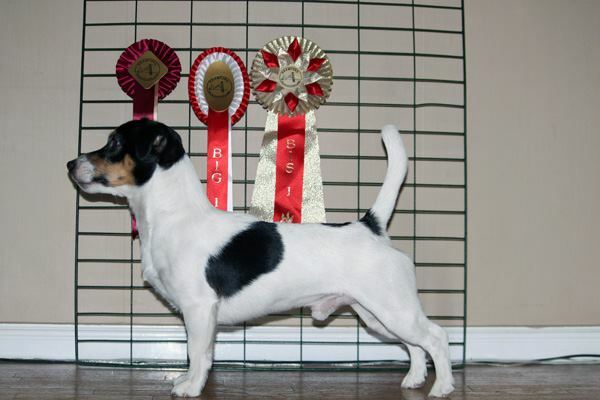 More info about Endy's parents and pedigree please look at here. 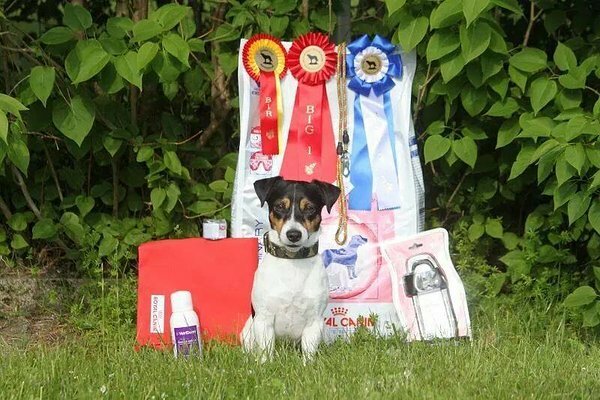 Some nice dogshow results: Top JRT competition 2013 in Show JRT category - Best female puppy 2013 II place; in open class BF3, working class BF2 and 3, CAC in Estonia and 3xCAC and 1xShow Winner in Lithuania. 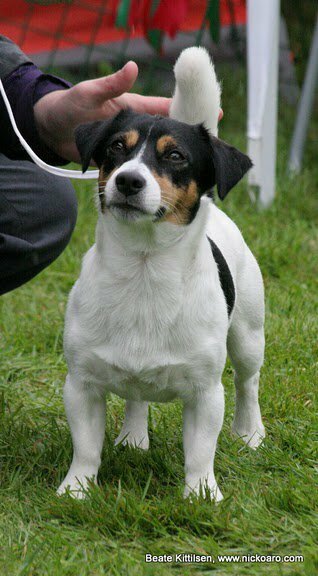 Shown mostly with excellent judgment. 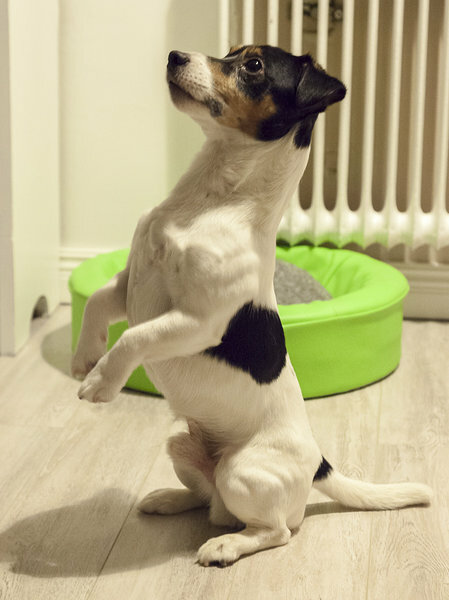 Endy is a very good leaner. 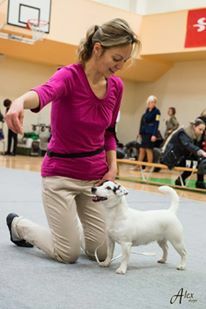 She is a great helper on the tricks and motivation training. 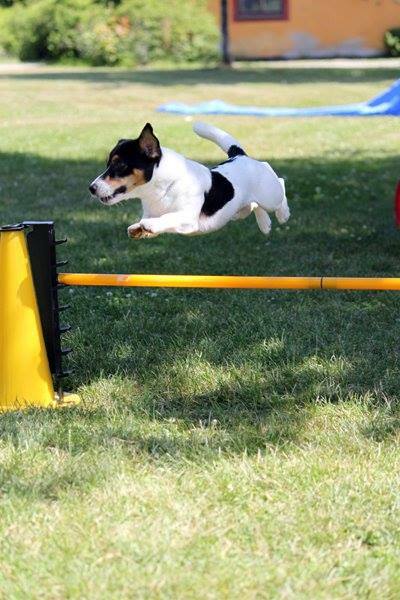 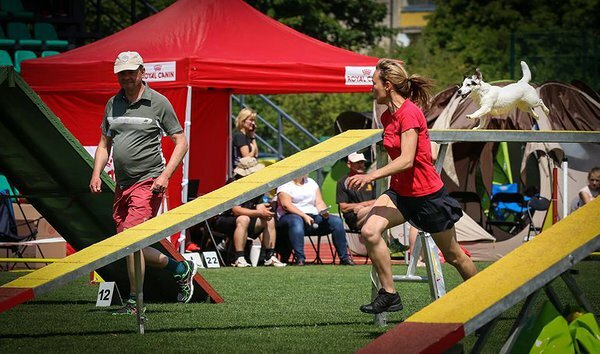 Endy likes agility. 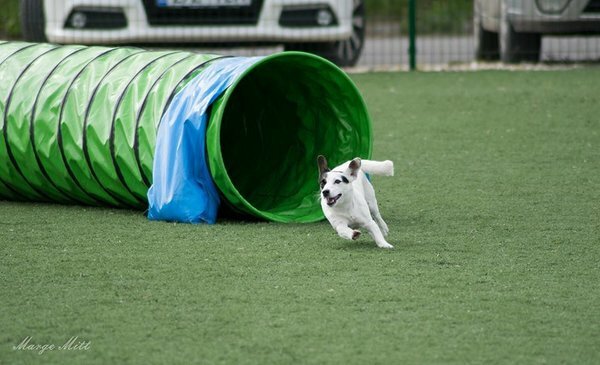 She is especially fast in tunnels. 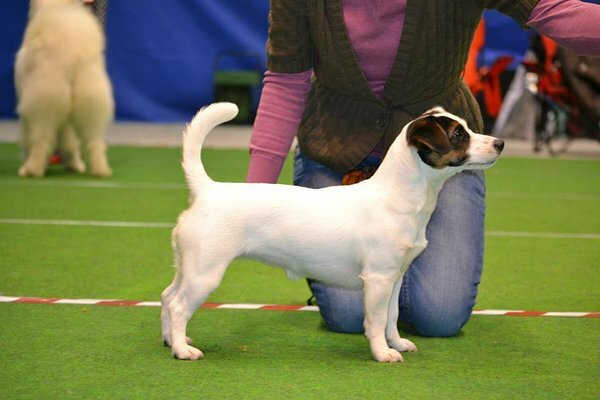 She won Tunnel Cup in beginners class twice (III place 2014 and II place in 2015). 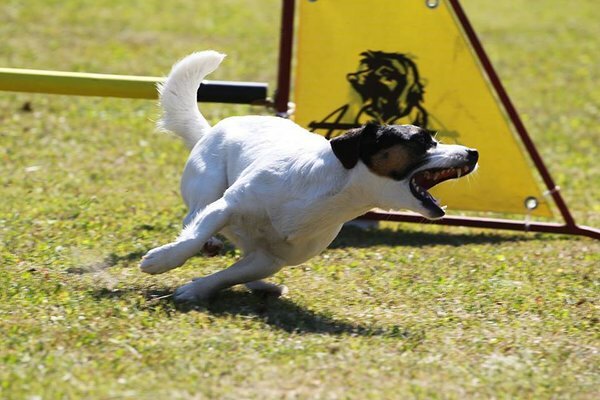 Endy compites now in A1 class.